I work at a desk, which means I sit at a desk, which means the parts of my body that get the most daily exercise are those not suited for the motions I put them through — namely the waggling of fingers on a keyboard and the furrowing of my brow on a regular basis. If I’m to exercise during my workday, I must create the opportunity to do so. Aside from joining my office tower’s gym, which sits on the bottom floor behind glass walls in a way that could hardly do more to make one understand the concept of physical exertion as public performance, I can score a bit of exercise simply by taking the stairs. When I’m feeling stumped or lost or inwardly deadened, I can simply exit through the stairwell door and put the drone of office life behind me. It’s strange, really, how differently this vertical space functions that the flowing horizontal space of a cubicle-free work farm. It’s silent, except for the noise of my footsteps on metal stairs, and it’s also isolated: I’ve yet to encounter a single other person on the stairs when I take my daily upwards constitutional. That last fact would not be if the building were more populated. As far as I know, only four floors have people on them. 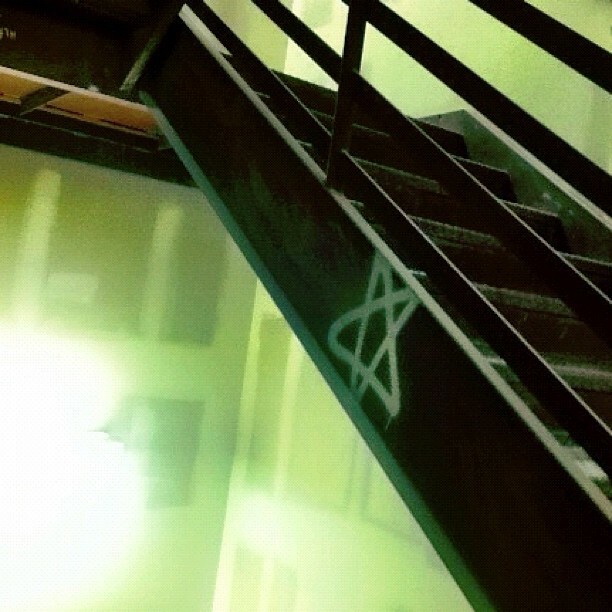 The rest are vacant and unrenovated — as hollow and spartan as the stairwell. In fact, the floor above me is the last one, moving from the ground up, that has people on it. The top half of the building features only that: the structure and nothing more. Weeks ago, I hiked up the steps all the way to the top, where there’s a roof access door that has never opened. (I was superstitiously frightened to touch it the first few times I trekked all the way to the top. Isn’t that strange?) I allow myself a few moments up there on the fifteenth story, where the air feels hotter and I know that I stand taller than anyone else, literally speaking, in this one physical structure. This time, a door opened. Picture a typical emergency access stairwell, in which you can’t see directly above or below wherever you stand because the steps form tight rectangles as they spiral down. Standing at the top of the spiral, I couldn’t see which door directly below me had opened, but I know I heard it. I stood there quietly for a few minutes, expecting to hear someone else step out and take the steps one way or the other. I’m a grown-up — newly thirty years old, in case you hadn’t heard — and I have a reasonable expectation about how much danger I should expect during my work day. Figuring that whatever would shortly step through this door probably wouldn’t kill me (and knowing that I had to get back to work soon), I began back down. Full disclosure: I walked a little more quietly, as if that would make a difference in the face of knifey death. 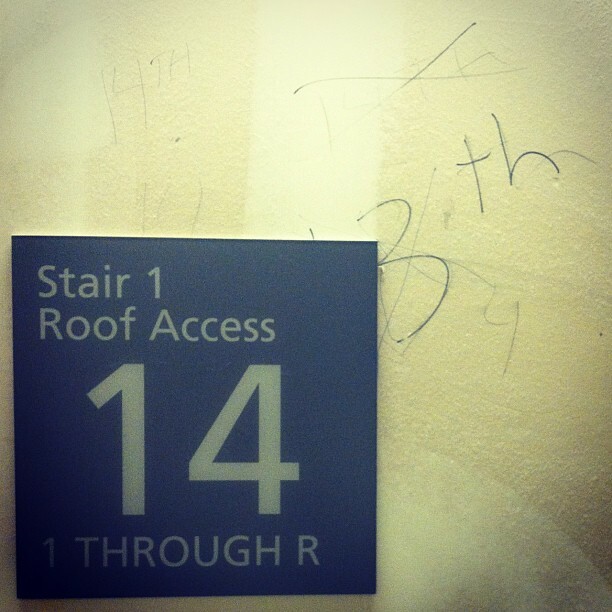 Just one floor down, I saw that the door to the fourteenth floor was open. It looked like my office, more or less, just minus paint, carpet, furniture, lights, and any other sign of professional infestation. I couldn’t do it. I couldn’t leave the safety of the stairwell and step out into this unsettled space, mostly because all the stairwell doors require key cards to pass through and I didn’t want to be trapped on the fourteenth floor if the door somehow closed while I was exploring. After all, I’d left my phone at my desk. So I just backed away and continued down the stairs. About two flights down, the door slammed. Obviously, this new building needs to be rented out. Someone probably had prospective tenants to see a vacant floor and merely propped open the door while they were up there. Then, a short time later, they realized they’d left the door open, so they closed it. High-rises don’t have fourteenth floors. The door that opened was the thirteenth floor, made over to look like a fourteenth floor because in the year 2012 humans are still that superstitious. I guess I can’t hold it against the building builders, you know? There is something irresistible in a locked door, workplace or not.